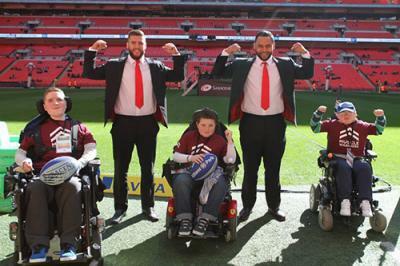 Billed as the ‘Biggest Club Match in World Rugby’, Derby Day saw a world record crowd of 83,889 rugby fans that included three Muscle Dream beneficiaries witness Saracens victory over Harlequins 39-17 at Wembley Stadium. Thanks to Saracens Rugby Club and specifically Stadium Director (Allianz Park), Gordon Banks, an extraordinary Muscle Dream experience took place on Saturday 22nd March 2014 for three Duchenne Muscular Dystrophy (DMD) sufferers. 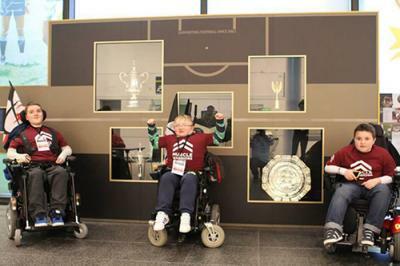 11yr-old Archie, 11yr-old Tom and 21yr-old Spencer were treated to a VIP-day like no other. 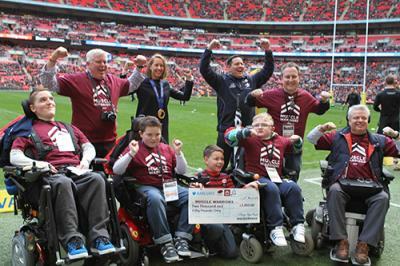 Pictured above: the British skeleton racer Lizzy Yarnold who won gold in the recent 2014 Winter Olympics in Sochi was on hand to meet our three Muscle Warriors and their respective dads that included a pitch-side cheque presentation by Ruggerbugs, one of the charity’s key partners – centre, holding cheque of £2,050 (generated from the Club & School CashBack Scheme) is Matthew Peasey along with his dad and Ruggerbugs Founder Andy Peasey (back row, right of Lizzy Yarnold). Several magical touch-points were arranged throughout the day including: a fascinating tour of Wembley Stadium by FA Tour Guide ‘Jack’, having a natter with the Chairman and Owner of Saracens Rugby Club Nigel Wray, participating in a group Muscle Warrior photo-shoot in the official Press Suite, visiting the home changing room and bumping into England’s most resilient player and Saracen’s record-breaking Captain Steve Borthwick. Other magical moments included ‘wheeling’ together out of the tunnel into the stadium, leading the Saracens Pride in Unity Parade (a celebration of youth and of the spirit of rugby) in a pitch-side lap around the stadium before kick-off giving Archie, Tom and Spencer the opportunity to experience the match day atmosphere, being presented with Saracens goody-bags and enjoying some great post-match chatter with several of the Saracens players including Chris Ashton in the magnificent Club Wembley Bobby Moore Suite over a pot of tea! “One of the enduring highlights for Archie, Tom, Spencer, their dads and I suspect our volunteers on the day was witnessing nearly 84,000 people deliver the world’s largest ever Muscle Warrior salute in a single moment – a visible symbol of hope, courage, strength and joy for all those with muscular dystrophy across the country. 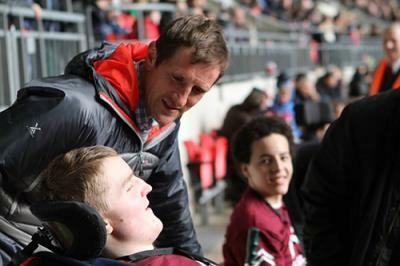 Additionally, it was good of World Cup winning legend, Will Greenwood (pictured below chatting with Spencer Kelly), to drop by and say hello to our Muscle Warriors”, said the charity’s CEO, Michael McGrath. Big thanks to the charity’s Social Network Champion and key charity Volunteer Steve Stone who not only coped with a high level of pre-match Twitter activity that included various tweets by @Saracens as well as some of the star players including England fly-half Owen Farrell @owen_faz (England fly-half) and Ben Spencer @Ben_spencer9 (scrum-half) but also managed to be our stand-in official photographer on the day. The adage, “a picture is worth a thousand words” refers to the notion that an idea can be conveyed with just a single still image. 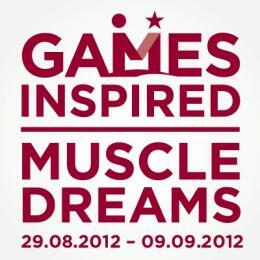 Our charity’s distinctive Muscle Warrior salute is increasingly being seen by thousand’s of people across the UK.  With your support, we will continue to play our part in raising further awareness about muscular dystrophy, a progressive muscle wasting disease that robs sufferers of their mobility, their independence and finally for those with the most severe form (Duchenne Muscular Dystrophy), their lives. If you would like to get involved in our work or help champion our cause, please reach out.